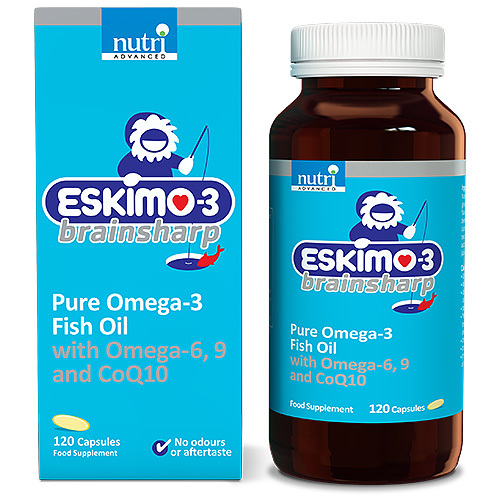 Eskimo-3 Brainsharp combines the unique stable fish oil, Eskimo-3, with ingredients such as CoQ10 and GLA to optimise brain function and provide energy support. Omega-3 fatty acids have been well studied for their role in the support of many systems in the body including the brain. This formula will suit anyone requiring additional support for healthy brain function. Eskimo-3 Brainsharp contains the Eskimo-3 fish oil. Derived from sustainable sources of oily fish living in the deep seas, Eskimo-3 is one the best researched and documented omega-3 supplements in existence. The beneficial effects of CoQ10 complement the formula with its ability to support energy production and act as an antioxidant to support the healthy brain. CoQ10 deficiency is common, especially among older adults. The mixture of fatty acids, CoQ10, vitamin D and antioxidants can help to support optimal brain function and many other systems including cardiovascular and musculoskeletal. No fish odour or aftertaste due to its stability. Fish oils that smell and have an aftertaste are generally rancid. Natural fish oil, capsule shell (gelatin, glycerol), rapeseed oil, evening primrose oil, flavouring: lemon flavouring, antioxidant blend [Pufanox] (lecithin (soy), vitamin E (alpha tocopherol), antioxidants: tocopherol-rich extracts, extract of rosemary, ascorbyl palmitate), coenzyme Q10 (ubiquinone), vitamin D (cholecalciferol). Take 2 capsules twice daily with food or as directed. Below are reviews of Eskimo-3 Brainsharp Fish Oil with CoQ10 - 120 Caps by bodykind customers. If you have tried this product we'd love to hear what you think so please leave a review. Eskimo-3 Brainsharp combines the unique stable fish oil, Eskimo-3, with ingredients such as CoQ10 and GLA to support optimising brain function and energy support. This formula may suit anyone requiring additional support for healthy brain function.